In my opinion, staycations are underrated. I love traveling and exploring new cities and countries, but those kinds of trips aren’t always that restful. And in keeping with my theme of rest this holiday season, I’m in total support of a making time for little vacations in my own backyard, without the stresses of airports and rental cars and currency exchanges and getting lost. 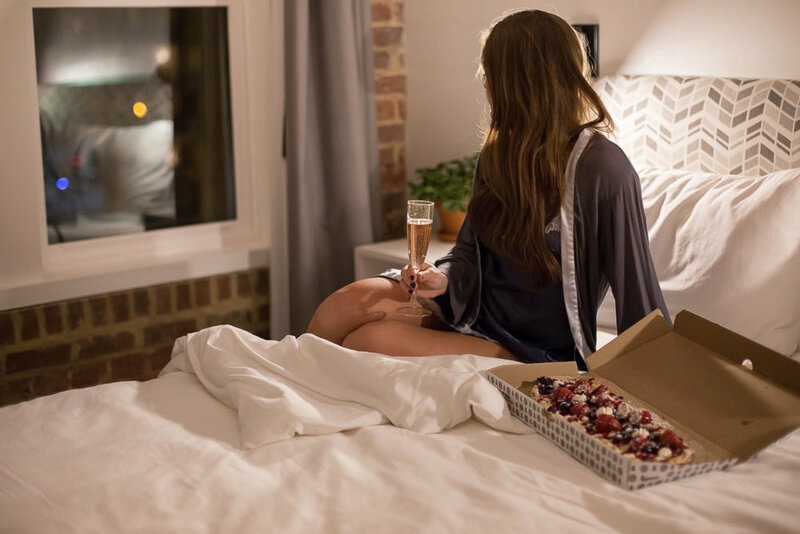 So, I was thrilled to be invited for a girls staycation at the new Hotel Hive in Washington, D.C., which is quickly becoming one of the highest rated hotels in all of D.C. and a leader in the new “micro-hotel” concept. On a Friday afternoon this past month, I packed (ahem, overpacked) a bag and took a taxi to northwest D.C. to meet some of my favorite girls for a “ladies night in.” No currency exchange required. Walking into Hotel Hive was like walking into a dreamy small-town Christmas movie, offering me no other option but to leave the chaos and stress of city life outside on the pavement 23rd Street NW. I was welcomed by cheerful staff who were so friendly that I thought, maybe, I actually knew them and had forgotten their names which would not be all that surprising for me. But no – they’re just happy people. And how could they not be when they get to work inside a space as gorgeous and filled with Christmas spirit as Hotel Hive?! Okay, I digress. And I know “technically” Christmas is “over.” (Haters.) Regardless, the warmth radiating from these sweet place – from the fireplace to the cozy benches to the friendly staff – was exactly what I needed after a season of almost constantly moving and living out of a suitcase. The lobby of Hotel Hive houses a homey, warm industrial-style cocktail bar that perfectly meshes the minimalist & modern micro-hotel vibes with the historic character built into its crumby exposed brick walls. It’s the perfect combination of trendy and cozy. It’s everything I wish I could be in interior design form. And, it also means you’ll get trendy cocktails (like the spiced old fashioned which, if you’re nice, can be served in silver tumblers) as well as an inviting brick fireplace and brightly lit turret lined with cushioned benches. Win-win. When I first arrived, as I was waiting for the other girls to arrive, I decided to skip the cocktails (for now) and instead enjoy some of the complimentary Vigilante coffee which was exactly what I needed after coming in from the freezing weather outside. Honestly, I could have sat in that cocktail bar all night, getting warm by the fire, enjoying the glittering Christmas tree, and stuffing my face with hot-out-of-the-oven pizza (did I mention my favorite local pizza joint, &pizza, in housed in Hotel Hive’s lobby?!). Finally, the girls arrive. We hug and gawk about each other’s’ outfits (as girls do) and compare notes about how stupid cold it is outside, and then make our way upstairs to the room. Guys. Don’t underestimate the “micro” hotel concept. It’s minimal, and you won’t find anything in there you don’t typically need when you’re staying a night or two at a hotel – no bulky armoires and dressers; no mini-fridges for groceries you don’t have and leftovers you won’t eat; no armchairs that will quickly be hidden under your coat and purse and will never actually be used as a chair. 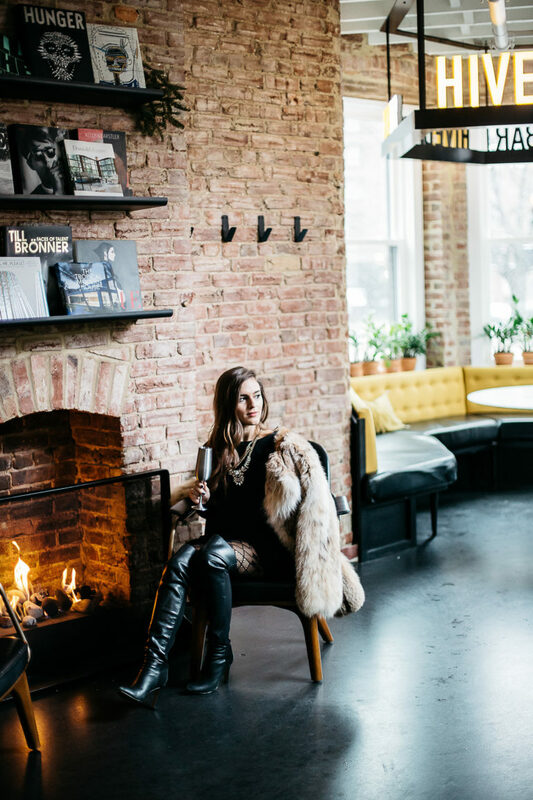 And let’s be real, you don’t need these things when you’re surrounded by world-class restaurants just minutes away in Dupont and Georgetown, and when you have the coziest sitting area just downstairs in the lobby or, when the weather’s warm, upstairs at the swanky rooftop bar. What you will find in the room is a sense of . . . calmness. The simplicity and warmth of the design and décor is dreamy, including exposed brick walls, dark wooden ceiling beams, white-on-white minimal furniture, fluffy white linens you just want to crawl into and never leave, adult-friendly bunk beds each with its own flat screen TV, sleek white marble bathrooms, and deep grey curtains suspended on industrial metal curtain rods. Basically Hotel Hive has captured what I always want my own home to resemble, except I can’t seem to declutter enough to ever achieve anything close to it. Oh well, Hotel Hive is not my home-away-from-home. After freshening up and settling in to our cozy rooms, we headed downstairs for cocktails and some pre-dinner pizza (yeah, you heard me: pre-dinner pizza . . . I know you’re jealous). The fire was lit and the bar was surprisingly lively, filled with guests and locals alike who all were equally in love with this charming and hip new cocktail bar in northwest D.C. Truthfully, it felt much less like I was walking into a generic and sterile “hotel bar” and much more like I wanted to come back here every. single. weekend. And if the feel-good vibes aren’t enough, the spiced old fashioned and truffle mushroom pizza with fig balsamic drizzle are sure to win you over. Although it took some effort to tear ourselves away from that bar, we had dinner reservations to make at the Tabard Inn in nearby Dupont Circle. This is by far one of my favorite places in D.C., especially during winter. Squashy antique sofas and armchairs, creaky hardwood floors that must be over a hundred years old, one of the few wood-burning fireplaces left in the city, all dimly lit by candlelight and antique lighting. And if you can manage to peel yourself away from the sitting area, you can enjoy dinner in one of the back dining rooms or, weather permitting, in the magical backyard garden covered by sparking bistro lights. Perfect spot for a girls night, for a date, or for a solo treat-yo’self afternoon spent curling up with a book for hours on end. If you’re not feeling Tabard Inn for some unfathomable reason, there’s no shortage of fantastic restaurants near Hotel Hive in the Georgetown or Dupont neighborhoods. You can find virtually any genre of food your heart desires, in almost any price range, including multiple Michelin-starred restaurants, the famous Watergate Hotel, and some kickbutt basement empanadas. Or, just hang out at Hotel Hive and try all the delicious pizzas and feel zero shame about it. Please invite me. After dinner, the girls and I returned back to Hotel Hive and quickly ditched our heels and coats for pajamas and the sweet sweet sounds of Justin Beiber and Selena Gomez. In the truest “ladies night in” fashion, we popped a bottle of sparkling pink prosecco, danced around in animal onesies like complete fools, and – obviously – ordered another post-dinner pizza (this time a dessert version, covered in whipped mascarpone cheese and berry compote). Yes, post-dinner pizza is also a thing. We laughed more than we all have in too long, it seemed, and slept harder than most of us could remember. 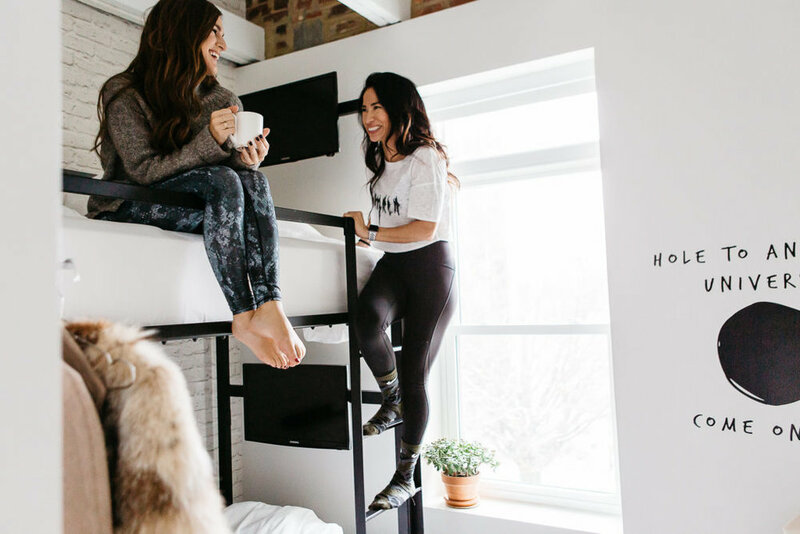 These girls are go-getters, entrepreneurs, serious lady bosses – and we all were in desperate need for an excuse to turn off distractions, enjoy being silly, and sleep. Hotel Hive gave us the perfect space for all that. The next morning greeted us like a cheesy rom-com, filling our rooms with the light of the first winter snowfall, which meant any jobs and plans we had for the day were a distant memory. More pizza was ordered for the room, of course (&pizza does some great breakfast pizzas, including one of the best avocado toasts I’ve ever had, with crispy chickpeas and feta cheese, as well as a pie smothered in tomato sauce, potatoes, and a fried egg). For hours until checkout, we ate breakfast in bed, sipped more Vigilante coffee, bundled up in our fluffy white comforters, and moved as slowly as the perfectly symmetrical snowflakes that danced outside our 23rd Street window. If only every Saturday morning could be so perfect. Not only am I dying for another chance to stay at Hotel Hive and drink all the spiced old fashioneds, but I’m now more committed than ever to making staycations a normal part of my in-between-travels routine. I highly recommend it. Get out of your apartment, go explore a new part of your city, and unplug a bit. Sleep in and enjoy a touch of hotel luxury without the normal travel stresses. Maybe for just a weekend, let your only concern be which pizza to order and whether to eat it in bed or in front of a fireplace. Oh and don’t forget to invite me. PHave a staycation planned for this winter season? Let me know in the comments below!